Lindsay is a film journalist and an aspiring playwright currently based in Berlin. To quote the Weihnachtsfilmfestival's 2018 program, "The most exciting stories happen in the kitchen." Many of us can attest to that. The kitchen is the setting for all kinds of drama and cheer yearround. The Dinner is Served shorts really served up some delicious and disturbing sustenance. The third day of the festival seemingly started out on a lighter note with a documentary about Santas but by the close of the first set of shorts the fire was stoked. The Romanian documentary short A Christmas Story from filmmaker Andrei Olănescu highlights Romanian Christmas traditions. Festival director Kirchner warned the audience that their stomachs might take a hit but even with that warning it didn't soften the blow much. Some footage from the market and the farm was hard to stomach. The juxtaposition of the more family-friendly images with carnage makes it all the more alarming. Several audience members were cringing and averting their eyes while the most sought after local butcher described the pig sacrifice that he finds necessary for a proper Christmas celebration. Olănescu for sure did not shy away from documenting reality, although not all audience members were really ready for that amount of truth. After the close of the food shorts, Kirchner added how he thought it appropriate to add A Christmas Story to the programming because during Christmastime many families consume meat and most don't consider how that meat gets on their table. Not a bad point. Pre-packaged meat somehow magically appears in our supermarkets in neat and tidy containers, but there's much more beneath the surface. One could say the same for Christmas. Todo el año es Navidad (Santa Lives in My Town), the documentary feature from writer/editor/director Néstor Frenkel also looks beyond the surface of Christmas, behind the lives of Argentinian men portraying Santa Claus. At first glance this film seems to have a more superficial tone but it actually takes a more in-depth look into the cultivation and consumerism behind the myth of Santa Claus. The collection of Santas is varied, with some taking themselves very seriously, others getting emotional about what they feel they represent for the children at this time of year. It was nice to see that all the Santas didn't fit into a uniform definition of a big-bellied, round-faced Santa. Black and white outdoor sequences tie together the different Santa stories in an interesting way, making each Santa have a distinct red and white color that pops as they stroll down the street. Frenkel video conferenced in from Argentina for a q&a with the audience and the film's post-production producer was also there with us. It was interesting to hear that Frenkel did not have any specific Christmas family traditions while growing up but now that he's a father he plays the part. He can't seem to forget that the magic and exploitation of Christmas are tied to one another. Even a bigger surprise is when he and his post-production producer stated that Santa Clause in Argentina (and much of Latin America) is strictly pegged to the image that Coca-Cola produced of Santa back so many years ago. There are several references to that within the film. They were both actually surprised to discover that in other parts of the world Santa is not that closely associated with Coca-Cola. The different incarnations of Santa Claus make this film an interesting watch, especially after finding out that they first found 30 Santas online, cast from 70 to 80 of them before finally ending up with their final thirty. The lasting impression from Frenkel's film is the joy that many of these men got from fulfilling this magical hero for so many kids throughout the month of December. Getting back to the food shorts, Self-Portrait With Mother (Eucharist) is a silent experimental film with a grown son and his mother sitting at an exquisitely decorated Christmas table. There is an eerie slow-mo feeling. The smoke released from their cigarettes, the texture of the pristine white tablecloth, all feel a bit off. It's almost as if one is watching a moving painting. You'd never think that two and a half minutes would feel so long. This short definitely intrigued me, urging me to see what else US filmmaker Gray Swartzel has up his sleeves. His Self-Portrait with Mother series can be viewed here. The animated French/UK film Le lapin de Noël (The Christmas Rabbit) by animator/writer/director Christophe Lopez-Huici appears to be lighter fare but in actuality is a tad grim. An elderly little lady gets into some trouble when her cat passes away on Christmas day. The animation is playful yet morose, accompanied by music that is both frenzied and melancholic. Honigkuchen (Honey Cake) from local filmmaker Cosmea Spelleken is the only film in this year's festival that was filmed in Berlin. It's always entertaining to notice familiar local settings when watching a film. Spelleken's film deals with the divide that more and more young Germans feel when going home for Christmas. Her protagonist Llli just wants a traditional holiday atmosphere but her parents and brother are fine with celebrating in a more modern, less family-oriented way. Honey cake is one way for her to get a taste of the Christmases of old that she so longs for. After the screening, I asked Spelleken if honey cake is an older German Christmas tradition because I'd never seen it before. She said that it was a tradition for her family but she wasn't sure about the rest of Germany. It was funny to hear that honey cake was also something new for her cast and crew, many of them not even liking it. Apparently it's very sweet. One big problem that she faced during production was finding enough cakes. After visiting 20 grocery stores, only 2 of them still had any left because it was after Christmas when they started shooting. Familial tensions are nothing new for holiday films but the way Spelleken highlights the modern German take from a young college student returning home is something I haven't seen before. Sadly, it's not just a problem facing college students but grown adults of all ages. Caramel Surprise from French filmmaker Fairouz M'Silti added greatly to the strong French-language film presence this year. The setting is a very corporate coffee chain, which will likely remind many of us of some earlier jobs. The cast works well off of one another. It's tangible, the complications of the friendship between store manager Mawena (Eye Haidara) and the aloof Alex (Anne-Laure Manceau ). The dialogue feels real, which makes sense coming from a female filmmaker. Part commentary on commercialization, focus of big business putting the almighty euro or dollar first but it also delves into friendship and one's dreams, both of which unavoidably get crushed along the way. This is one of the short films from this year that would probably have room to developed it into a feature. Masiranje šunke (The Ham Message) from director David Jovanović presents another conflict mother/child conflict, this one centering on a chef-in-training son who returns home for his father's birthday. He prepares a culinary feast for his parents but his mother takes offence, barely giving his meal a chance. The biggest insult is when she adds a common all-around spice that is popular in Serbia, used like salt to mask whatever flavors are already there. Yet another strong addition to the silent films at this year's festival is Frank Ychou's Artem Silendi. The costume design, set design and slight looks between the nuns sitting at the dinner table are top notch. Nuns misbehaving but not really in the way one might expect. Watch closely because not all of the nuns are as traditional as they first appear. There was another two-minute long experimental film, Christmas Microwave directed by Jonty Toosey, that was a lot of fun and best not to spoil it, rather just watch it for yourself here. The Drama Before Christmas shorts included the Polish film W grudniu po południu (When Hell Freezes Over) about a man's struggle living with his overbearing and judgmental mother, not "making fun of him" but in her words "making fun of his vices." The young man Jędrzej wants to dress up as Santa Claus for the neighbor's kids but his mother isn't confident that he has what it takes. There could have definitely been a separate block of shorts with the theme trouble with mothers because there was no shortage of mother issues on the silver screen. It's sad but true that mothers, while often receiving the most love also receive a great deal of hostility/resentment. Les bigorneaux (The Winkles) was a nice change of pace. Instead of a mother's presence, Zoé (Tiphaine Daviot) has issues with her dad Guy (Philippe Rebbot) not really helping her run his neighborhood bar, rather preoccupying his time with making mixtapes. Her mother died quite young, so she was forced to step up. The sudden discovery of an unusual disorder makes Zoé reconsider her trapped existence in their small ocean hamlet. Director and co-writer Alice Vial infuses touches of comic-timing interspersed with more dramatic elements that hits home in just the right way. La slitta (The Sled) calls to mind a famous Orsen Welles film in more than one way. Some of the more serious elements of xenophobia and isolation that director Emanuela Ponzano explores are handled quite effectively. Through the impressionable eyes of only child Alfred (Riccardo Specchio) we see his world, a world that seems very gray and lonely. He lives with his dispirited parents deep in the snow-covered Italian mountainside. Ponzano who was also the co-writer and producer on the film portrays Alfred's mother whose dismal existence is characterized by blank stares and slowly burning cigarettes. Ponzano is actually quite an accomplished actress in Italy, Belgium and beyond. The father's words of hatred naturally affect Alfred but finding a sled and interacting with a foreign boy (Alban Pajolli) shows signs of hope. Reconnected is an edgy family drama from co-writer/editor/producer/director Summer-Joy Main. Robert Kerbeck co-wrote the script and also plays down-and-out estranged husband Bob. He's clearly not doing so well after fooling around with a local waitress and being kicked out of the family's comfortable home. Bob's difficult mother-in-law doesn't even try to mask her disdain for him, instead she's like a bat out of hell which is surprising at her age. She's actually terrifying. It's Bob versus his wife's protective and overbearing mother. Who will make it out on top? Georgina Pretto, the cinematographer and camera operator for Evangelina Montes's film about two life-long elderly female friends, was available for a discussion after the screening of Adela (Adele). This short film was one of the highlights of the day, an intimate depiction of an older woman and her only friend. Adela (Pía Uribelarrea) spends a great deal of her time in the old-looking locker room of her local sports club. It's Christmas and her old friend Noemi (Silvia Geijo) joins her for a little celebration. They reminisce about their relationship when they were teenagers. Adela wishes that it could be like the old days. Montes was clearly aware how rare it is for older women to be shot in close-ups and shown half-naked in film because Adela almost feels like a response to that. Before filming, Pretto and Montes discussed a lot about beauty, wanting to show how it really is for women in their sixties. Pretto discussed the closeknit filming that took place in the locker room and how finding that location was the hardest task because most sports clubs in Buenos Aires nowadays are very modern. The space was so small that they shot one side of the room first and then had to reshoot the other side with the shower, shooting for two and a half days in total. Christmas was so hot that year so when Pretto used smoke during the shooting the cast and crew weren't so thrilled. The final images mixing the smoke and subtle lighting, many actually from Christmas lights, are shot with such a delicate touch. I think that Pretto stated it best when she said that the film was made with "an open concept of love." The lovely, subdued South Korean film 메리 크리스마스 미스터 모 (Merry Christmas Mr. Mo) from first-time writer/director Lim Dae-hyung was the second feature of the day and boy was it something special. Merry Christmas Mr. Mo stars veteran Korean actor Gi Ju-bong as Mr. Mo, a grumpy old barber whose days in a small town are filled with the same routine day in and day out. His face will be recognizable for anyone who's seen a fare share of Korean films. Relative newcomer Oh Jung-hwan portrays Mo's son Stephen, an aspiring filmmaker, who much to his girlfriend Ye-won's (Go Won-hee) dismay is floundering and unmotivated. Mr. Mo convinces his son and Ye-won to help him make a short film in the style of Charlie Chaplin. Gi's straight-faced delivery is downplayed throughout the film, which could have easily gone in the direction of in-your-face slapstick. Instead, Lim manages to bring out subtle and gentle performances from the entire cast. The black & white cinematography by Moon Myung-hwan is glorious. While some might say that this film is too much of a slow-burn, once given a chance its charm will take hold and allow you to settle comfortably in the absurd world of Mr. Mo. Family drama mixed with its fair share of subtle comic nuances and perfect timing make Mr. Mo and his story one that is quite charming and not at all over-the-top like some K-dramas (Korean TV programs) are well known for, quite similar to Mexico's telenovelas or US soaps. It's a shame that a Korean indie film like Merry Christmas Mr. Mo will likely not get a wide release but lucky for us who were present to watch it at the Weihnachtsfilmfestival this year. 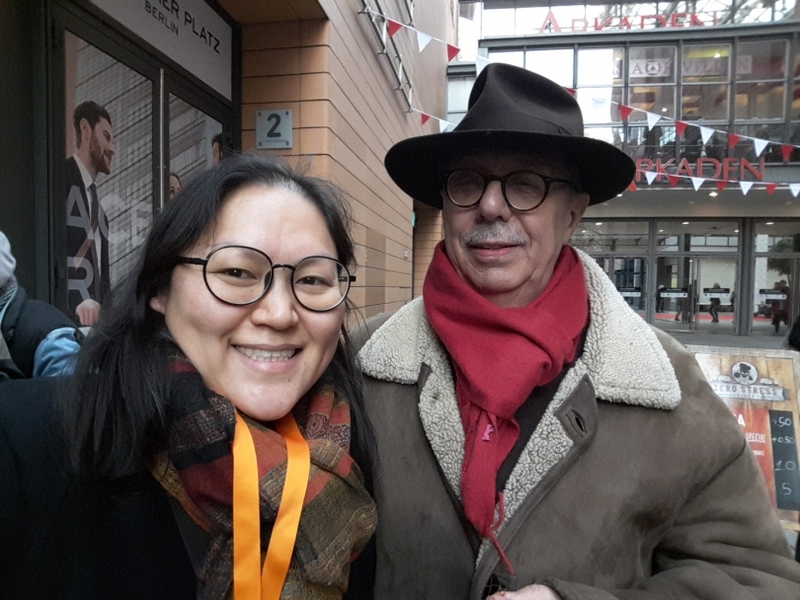 With Dieter Kosslick during his last Berlinale.